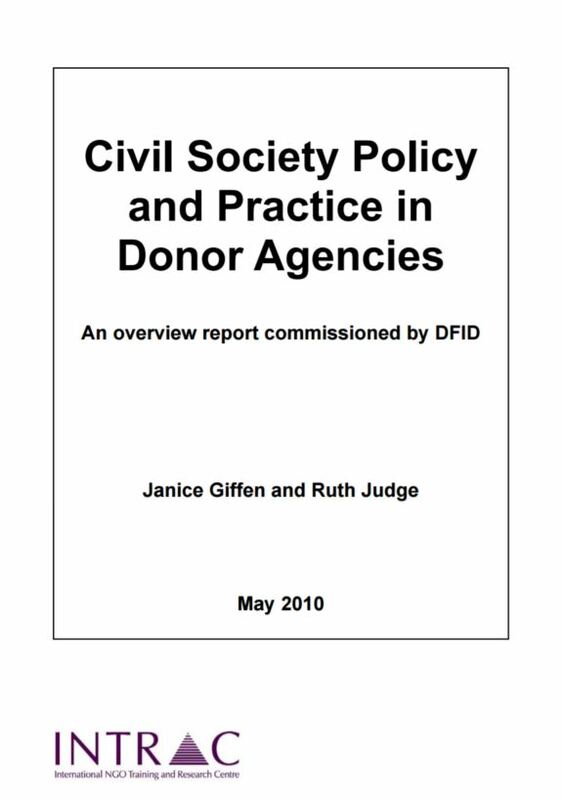 INTRAC was commissioned by DFID to provide a brief overview of civil society policy and practice amongst a variety of multilateral and bilateral donors. The findings, in this paper, examine the policy and practice of the African Development Bank, the Asian Development Bank, the EC, UNDP, UNICEF, the World Bank, CIDA, Danida, Irish Aid, MFA Netherlands, Norad, Sida and USAID. Whilst policy is strong, with many bilateral donors placing a notable emphasis on strengthening southern civil society as an end in itself, practice is difficult to assess due to decentralised ways of working and the use of multiple and varied intermediaries. The paper looks at issues arising from current policy and practice, such as the potential tension between the priorities of the aid effectiveness approach and the desire to foster and support a diverse and vibrant civil society in the south. The policy goal of diversity is not operationalised in practice through mechanisms that ensure greater outreach and accessibility, and donors are beginning to realise that they need to examine more closely the forms of support they use to work with civil society.